The sign reads “”Bienvenido al Paraiso – Welcome to Paradise – and each time I pass through the gates of Valle Escondido to my home-away-from-home in Boquete, Panama, I feel like I’m experiencing a little slice of Eden. Nestled into the base of Volcan Baru is a “hidden valley” of lush native plantlife, tranquil ponds filled with koi, and crystal clear streams surrounded by a tropical forest. Even now, during the rainy season, it’s spectacular. And while I love my coastal home back in the States, I always look forward to returning to Boquete. As always, I have an agenda while I’m here. While I’m best known back home as the proprietress of Mon Ami Gourmet Deli & Antiques, I also have an alter-ego as the COO and Creative Director of Toby and Max Jewelry. My partner and the designer-in-residence, Sandy Comstock, lives here in Boquete as a permanent resident with her long-time companion Oscar the Poodle. And since the “Muhammed” refuses to leave Paradise and to come back to the States for our annual business review, the “Mountain” is forced to come here. Which is why I am once again half a world away from The Nice Catholic Boy, my cozy little shop, and my personal comfort zone. Getting here takes some doing. It’s a long trip and I usually head for the hammock as soon as I get here for a nice, long siesta before I hit the deck with my usual full-speed-ahead enthusiasm. There are people to see, places to go, designs to review, issues to discuss, and plans to make for the year ahead. 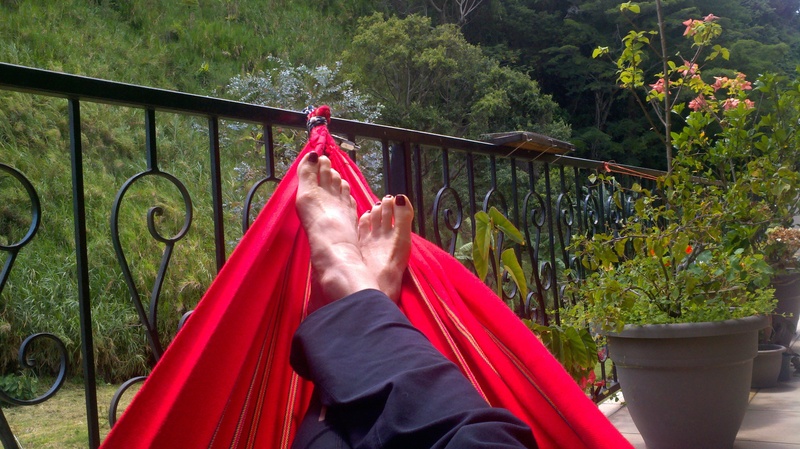 My agenda for this year’s trip quickly went south, however, when I couldn’t ply myself free of the hammock due to a severe sinus headache, which I attributed to the intense change in barometric pressure. This quickly morphed into a throbbing toothache and swollen jaw, which I treated with what I could find at the local farmacia. But by the evening of Miserable Day Four, I could bear it no more and surrendered my name, rank, passport #, you name it – puhleeeze, Somebody, GET ME SOME DRUGS OR GET ME ON A PLANE FOR HOME! Sympathetic friends came bearing gifts of strong drink, then bundled me into the backseat and headed off into the hills where a local dentist kept late night hours in his home-based clinic, in between operating a small cantina and hotel. (Admittedly, I was a bit anxious about having any dental work done in a third world country, but at this point I would have been willing to see a veterinarian. Seriously.) Dr. Riviera’s office was a far cry from the beautifully decorated clinic of my dentist back home, and his equipment was clearly older than me, but he was kind, thorough, and a competent professional and I knew I was in good hands. Three more office visits, two x-rays, ten whole dollars and a trip to the farmacia for the Good Stuff … and I find myself nine days later operating at a markedly subdued pace and contemplating the Best Laid Plans. On top of it all, it’s raining here in Boquete. I understand its warm and sunny back home and has been since I left. Oh, the irony of it all …. But juxtaposed against all the things I haven’t been able to get done since arriving in Paradise is something my friend Connie Spinner will be delighted to hear. During the last week, I’ve read three books. I went to a birthday party for some Panamanian friends at their home (this is a BIG deal for a gringa). I got up early and went to mass, but since I was too nausaus to participate, I sat in the back and listened to the nuns sing. I took a lot of siestas, and I ate a lot of soup. I spent more time in the hammock and listened to the birds. I took a few walks around Valle Escondido and marveled at the breathless beauty of my surroundings. I’ve gone a whole week without an espresso. And yesterday, I was treated to a rare sighting of a Basilisk lizard, known locally as the Legarto de Jesus Cristo because they can literally walk on water. I’ll probably never see one again! There’s still a week left before I return to the States and back to the life I live at warp speed. Messages to return, meetings to attend, catering jobs to bid, lattes and lunches to make, orders to fill, people to meet and places to go. And a root canal. In the meantime, I know I need to make the most of my time here in Panama. Which is why, first thing in the manana, I’m headed for my hammock. I did not know your blog existed until you mentioned it at the shop. I look forward to ‘catching up’ as I have the time, and reading about Valle Escondito was a delightful little armchair visit to a future exploratory destination for us. Thanks for taking the time to do a blog, as you are one very busy human in the community!